A common belief is that pain is uncommon and short lived in adolescents. However, the burden of pain in adolescents is unclear because of limitations in previous research. The aim of this study is to estimate the prevalence of headache, stomach-ache and backache in adolescents and to explore the extent to which these three forms of pain coexist based upon a representative sample of adolescents from 28 countries. Data were analysed from three consecutive waves (1997/98, 2001/02 and 2005/06) of the Health Behavior in School-aged Children: WHO Collaborative Cross-National survey (HBSC). 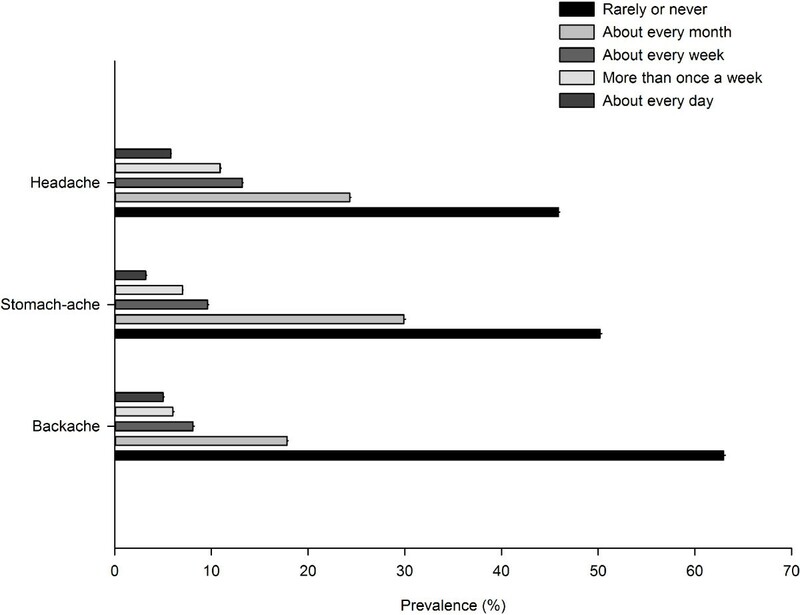 Prevalence estimates are based upon adolescents who reported experiencing headache, stomach-ache or backache at least monthly for the last 6 months. There were a total of 404,206 participants with a mean (±SD) age of 13.6 (±1.7) years (range 9.8 to 17.3 years). The prevalence of headache was 54.1%, stomach-ache 49.8%, backache 37%, and at least one of the three pains 74.4%. Girls had a higher prevalence of the three pains than boys and the prevalence of pain increased with age. Headache, stomach-ache and backache frequently coexist, for example, of those with headache: 21.2% had headache alone, 31% suffered from both headache and stomach-ache, 12.1% suffered from backache and headache, and 35.7% had all three pains. Somatic pain is very common in adolescents, more often coexisting than occurring in isolation. Our data supports the need for further research to improve the understanding of these pains in adolescents. Adolescence marks the transition from childhood to adult life. Pain during adolescence is an important predictor of future pain [1–3]. A Danish twins study  found adolescents with persistent low back pain were 3.5 times more likely to have low back pain in adulthood. Co-occurrence of low back pain and headache in adolescence further increases the risk of developing future pain which draws attention to the significance of multiple pains . Similar to adults, substantial economic costs can be attributed to pain in adolescents by way of direct medical costs, parental work absence and childcare expenses [5, 6]. In adulthood the estimated cost of pain-related lost productivity time is $61.2 billon a year in the United States  with headache and back pain the leading contributors to this cost. In Europe the total cost of headache alone is estimated to exceed €20 billion per year . Given the apparent link between adolescent pain and pain in adult life, steps to better understand and prevent adolescent pain are appropriate. An important first step in public health management is to identify the extent of the problem. Data were obtained from three consecutive waves (1997/98, 2001/02 and 2005/06) of the ‘Health Behaviour in School-aged Children: WHO Collaborative Cross-National Survey (HBSC)’. The HBSC research network is an international alliance of researchers that conduct four-yearly cross-national surveys. Data is collected from 11-, 13- and 15-year-olds regarding their health, well-being, social environments and health behaviours. A standardised research protocol has been developed by the HBSC research network for the purpose of securing valid, reliable, and comparable data. The HBSC study design, methods and data collection dates have been described in detail elsewhere [14–16]. Three age groups – mean of 11.5, 13.5 and 15.5 years – are sampled via administration of surveys within school classes. For the majority of participating countries a nationally representative sample is drawn. The primary sampling unit is the school class or, where a sample frame of classes is not available, the whole school. In the latter circumstances sampling is performed across school grades to account for students that have been advanced or held back. Cluster sampling is therefore used in which the primary sampling unit is the class (or school) rather than the individual student. The desired sample size for each age group is 1500 students per country (750 per gender). Once data is collected from the participating countries files are exported to the HBSC data banks where data is checked and cleaned in accordance to strict criteria. A list of participating researchers, countries and select reports can be found at http://www.hbsc.org. Data from 28 countries across Europe, North America and Israel were extracted for this study. In Belgium separate surveys were conducted for Flemish and French speaking regions. Respondent demographics (gender, age and country) and data from the HBSC symptoms checklist (HBSC-SCL) were accessed. Responses to questions pertaining to headache, stomach-ache and backache were extracted for evaluation. The frequency of the respective pains was listed as a single multipart question: “In the last 6 months, how often have you had the following?” a list of symptoms included: headache, stomach-ache and backache. For each type of pain, respondents were required to specify the frequency of pain in the last six months on a five point scale: (1) “about every day”; (2) “more than once a week”; (3) “about every week”; (4) “about every month”; or (5) “rarely or never”. No details regarding the duration and intensity of somatic pain were available. The HBSC-SCL enables comparable assessment of pain across countries, age groups and genders . The prevalence of headache, stomach-ache and backache was estimated by analysing the combined data from the 1997/98, 2001/02 and 2005/06 survey waves. Prevalence estimates are based upon adolescents who reported experiencing headache, stomach-ache or backache at least every month for the last 6 months. Prevalence rates were calculated and then plotted using SigmaPlot version 12. The extent to which the three forms of pain coexist in adolescents was explored by constructing frequency distribution tables and cross-tabulation using SPSS version 20. Membership of the clusters of coexisting pains was illustrated using a three set area-proportional Venn diagram using an applet based on the method described by Chow and Rogers . Univariate logistic regression models were constructed to investigate the odds of experiencing an individual pain type which also coexisted with another pain type. These were carried out using Statistical Analysis System (SAS) version 9.3. Data from a total of 404,206 adolescents in 28 countries were available for analysis. Individual participants’ age ranged from 9.8 years to 17.3 years. For 11-, 13-, and 15-year age groups the mean age of respondents was 11.6 years, 13.6 years and 15.6 years respectively. There were slightly more girls (51.2%) than boys (48.8%) and the three waves were of similar size (Table 1). (*Waves and countries without HBSC-SCL data: Spain 1997/98, Slovak republic 2001/02). Prevalence of headache, stomach-ache and backache by frequency of occurrence. (Excluding adolescents who did not state: headache n = 5620, 1.4%; stomach-ache n = 6412, 1.6% and backache n = 7142, 1.8%). 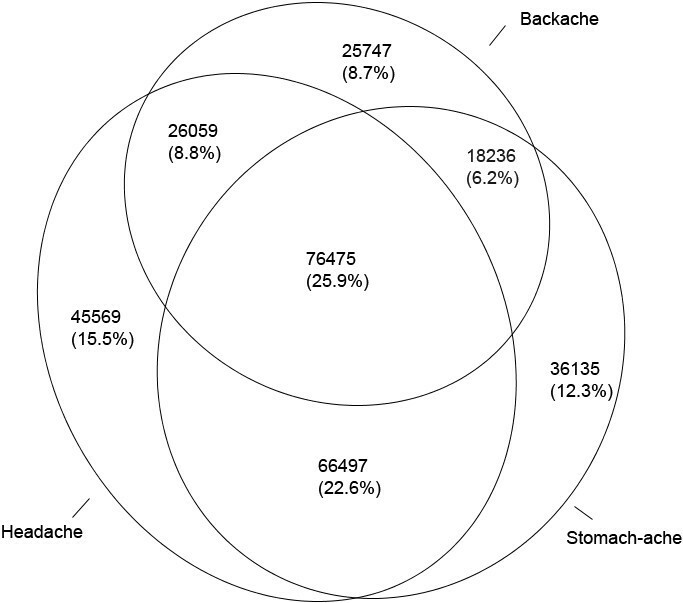 Prevalence of headache, stomach-ache and backache by gender and age-group. (Excluding adolescents who did not state: gender*headache n = 5620, 1.4%; gender*stomach-ache n = 6412, 1.6% and gender*backache n = 7142, 1.8%; age-group*headache n = 7590, 1.9%; age-group*stomach-ache n = 9096, 2.3%; age-group*backache n = 8378, 2.1%). Figure 3 proportionally represents the extent to which the three pains coexisted in adolescents. It can be seen that each of the three pains commonly coexist with one or both of the other pain conditions. For example, of the adolescents with headache: 21.2% (21.1% to 21.4%) had headache alone, 31.0% (30.8% to 31.2%) also suffered stomach-ache, 12.1% (12% to 12.3%) suffered from backache and headache, and 35.7% (35.4% to 35.8%) had all three pains. Univariate logistic modelling found adolescents with pain (headache, stomach-ache or backache) were at increased odds of experiencing coexisting pain. This was highest for headache and stomach-ache OR = 4.7 (4.6 to 4.7), followed by headache and backache OR = 2.9 (2.8 to 2.9) and stomach-ache and backache OR = 2.6 (2.6 to 2.7). Proportional Venn diagram representing the coexistence of pain in adolescents. (Excluding 8235 adolescents whose pain frequency was not stated). Traditionally back pain is considered a condition of middle age and is regarded as being uncommon and/or short lived in adolescents. Reflecting this view current clinical practice guidelines specify that back pain in those younger than 20 years is a ‘red flag’ which should alert clinicians to the possibility of serious spinal pathology [19, 20]. Further investigation via imaging and laboratory testing is then recommended. Our finding of a high prevalence of backache in adolescents questions the clinical utility of ‘age of onset <20 years’ as red flag to screen for serious disease . Additionally many clinical practice guidelines explicitly state that their treatment recommendations only apply to adults . Clinical practice guidelines should be reviewed to consider the implications of the high prevalence of pain in adolescents. 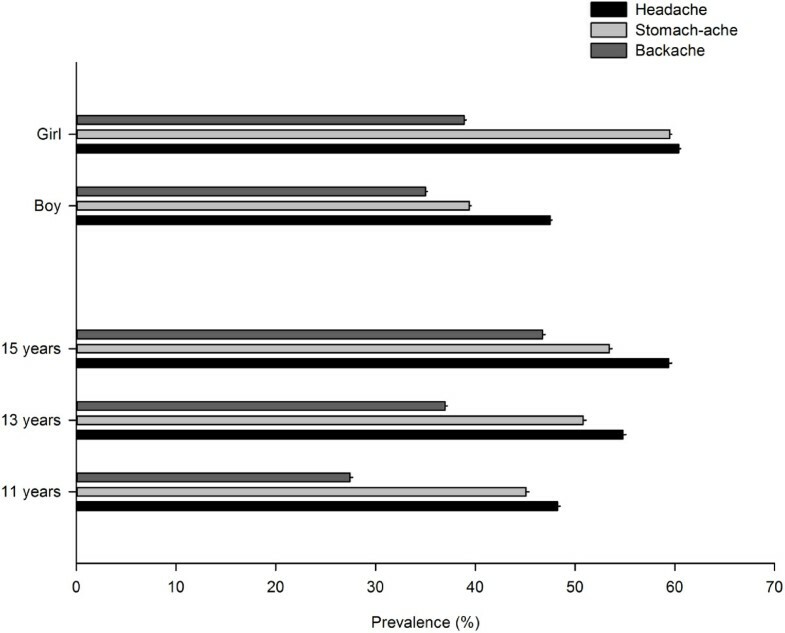 Our estimates of the prevalence of headache, stomach-ache and backache are at the upper bounds or higher than the wide range of previous estimates reported in King and colleagues’ review of chronic pain . These differences may be explained in part by differences in ages of the young people studied, case definition, and recall period . The way in which different types of somatic pain are defined contributes to variations in previous prevalence estimates. A study  of low back pain in British school-children (11-14 years, girls 53.9%) illustrates the effect of a different operational definition. Directed by a pain diagram and the severity measure ‘for one day or longer in the prior month’, adolescents reported the prevalence of back pain as 26%, which is substantially less than the 37.0% backache estimate obtained for England in this analysis. Moreover, adolescence is defined by the WHO as the period between 10 and 19 years . The HBSC study methods encompass a broad age range but ensure that a minimum of 95% of the eligible target population falls within the sample frame 11-15 years . Given that the prevalence of somatic pain in children and adolescents increases with age it is reasonable to suggest that disparities in pain prevalence estimates may be explained by the variability in the age distribution of previous studies. For example, a Swedish study  reported the monthly prevalence of headache in children (7-16 years, girls 48.6%) to be 26%, which is substantially lower than this study’s estimate of 63.1% from Sweden. The difference is likely due to the fact that 20% of the sample was aged below 11 years. A one-month time period for reporting prevalence was used in this study on the basis of recently published consensus  and empirically-based  recommendations in the field of back pain. Opportunity exists for a consensus approach to standardise important definitional components of paediatric somatic pain including the frequency and duration of pain and the age distribution in sampling strategies. Our study found somatic pain in adolescents most commonly occurs in multiple-pain form. In particular young people had the greatest odds of coexisting pain when they experienced headache and stomach-ache, which appears to align with the prevailing knowledge . Contrary to a previous study  we found girls have a higher prevalence of multiple-pains than boys and the prevalence of multiple-pains increases with age. Given the high prevalence of individual pains it is likely that some coexistence of individual pains will occur despite unrelated cause. Several potential physical, behavioural and mental developmental changes that coincide with pubertal development have been hypothesised to explain the age and gender differences that were observed in this study [11, 30, 31]. LeResche et al. found both the prevalence of one pain condition and the prevalence of two or more pain conditions increased with increasing physical maturity, which may explain the significant increase in the pain prevalence with age in our study. Very few studies have described the extent to which somatic pains coexist in adolescents and as a consequence there is a paucity of knowledge in this field. Suffering and developmental consequences are important actual and potential implications of somatic pain in adolescence. Somatic pain has been associated with anxiety and depression as well as school absenteeism and poor quality of life . The direct cost of health care is likely to already be apparent given the relationship between subjective health complaints and high medicine use in adolescents . Somatic pain during adolescence is associated with re-occurrence later in life [1–4] and it appears that some groups of children are predisposed to ongoing pain-related problems, including work disruption, into adulthood . Given that the majority of sick leave in adults is due to somatic pains , prevention and management of these problems in adolescence could conceivably have an important impact on disease burden in adults. The HBSC research network is an international alliance of researchers. Data collection in each country or region was funded at the national level. The National Health Service of Scotland and the Chief Medical Officer Directorate of the Scottish Government funded the HBSC International Coordinating Centre at the Child and Adolescent Health Research Unit, University of Edinburgh.